Choosing which TV to buy can seem like a pretty daunting prospect. For one, there's just so much choice out there. Then you throw into the mix all the different types and different features that are available and what you end up if is a very difficult decision to have to make! Finding the right second hand television for you will depend on three things: 1) what types of programmes or uses you expect to get from it, 2) how you like your TV viewing experience to be, and 3) where you intend to put your TV in a room. And that's what this buyer's guide is all about - the what, how and why of the used television world. This guide will answer all the questions you are likely to have and arm you with the necessary information and knowledge to pick the best model for you. As with all technology, televisions have their own set of features and technical jargon associated with them. These are often the key selling points of particular models so it's important that you understand what they all mean. Understanding the specific features will allow you to narrow down your search for a second hand television and it really has to be your starting point. So, without further ado, let's break down the jargon! TV screen technology has developed significantly in recent years leading to fantastic improvements in the viewing experience and one big decision to make is whether to go for a LED or OLED used television. To be fair, both are excellent for viewing and give you clear, bright and vivid colours. The different ways that pixels on the screen are lit produces your colour and contrast. OLED is the most recent of these two technologies and OLED televisions deliver a smoother overall image, less motion blur and deeper blacks. OLED (Organic Light-Emitting Diode) televisions pass electricity through the screen diodes to emit coloured light (hence the name). This, essentially, is what makes up the picture you see on your screen. The smooth image and deep blacks are created as the diodes are available to create their own light which can be individually turned off. The result is that OLED televisions have the most vivid and the richest colour and contrast of all TVs. Excellent quality will be guaranteed regardless of what angle you are viewing from. Other advantages are that the screens of OLED televisions tend to be thinner than LED models and they are also use up less energy too. You can pretty much guarantee that you'll find a greater choice of LED models. Firstly, as it is older technology - so in the used television market, it stands to reason that they'll be more of these available. But there are far less OLED models on the market anyway as LED is a technology that is far easier to produce. LED (Light Emitting Diodes) technology utilises a backlighting panel which shines light through a liquid crystal display (LCD) screen. You get bright and vivid colours produced and usually a fair bit cheaper than the price of OLED models, but still with excellent overall quality. Our next port of call in your guide to buying a used TV is to unpick screen resolution. In simple terms the resolution indicates the quality of the screen. It is measured in the number of pixels per square inch and the picture quality improves the higher the number of pixels. The top of the range is 4K, or UHD or 4K Ultra HD. These models have as much as four times more pixels than you will find with a Full HD TV. A 4K TV will have over 8 million pixels. Full HD is also referred to as 1080p - these will have 1920 x 1080 pixels and Full HD will have in excess of 2 million pixels. Together with the screen resolution, the other thing that will determine the picture quality of a second hand TV is its processing rate. This is the speed with which the television processes screen changes - the higher the processing rate, the smoother the viewing experience will be. The processing rate is also known as the refresh rate and usually it is measured in Hz (hertz). 50 or 60 Hz is the usual lower limit, this will give a smooth and good picture which will be absolutely fine for day to day, general viewing. 100 Hz models will handle fast images, like high action movies better and 200 Hz will be perfect for the fastest-moving sports and for use as a gaming screen. Alongside picture quality, a key consideration for anybody purchasing a television will be what size screen to go for. More and more used TVs are classed as large screen - anything from 32" up to over 80". You'd be forgiven for thinking that bigger is better as screen sizes do keep getting bigger all the time. However, there are a couple of things to bear in mind. Firstly, you can actually fit more space into a TV screen that you used to be able to. For example, the modern 50" screen will take up about the same size as a 42" screen would have done six or seven years ago. 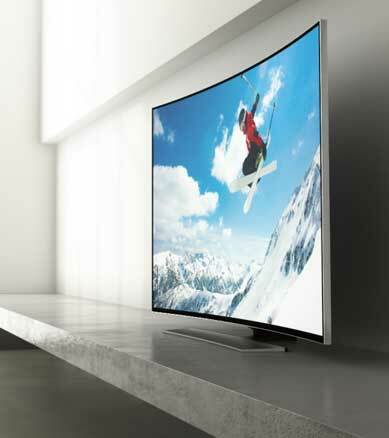 This is due to the bezel (the outer rim) that surrounds television screens being narrower nowadays. This means what might sound like a ridiculously large sized screen probably won't look so out of place in a room you first thought it could be too big for. But it is important that you do choose an appropriate size. Of course, personal preference is the overriding factor but the distance from the screen to where you will actually be sitting to watch TV should be considered. As a general rule of thumb, if you will be sitting within 1.5m of the TV, the screen shouldn't really be much more than 32" to ensure comfortable viewing. Similarly, you really need to be over 3m away from any screen that is over 55" to get the most out of it. Between 2-2.5m is about right for screen sizes between 40”-45". But, ultimately it is your own choice. Of course, for a perfect television viewing experience it's not just about vision, it's about sound as well. The sound you get from the vast majority of second hand televisions will be good, if not great. However, in truth, the overall quality in television sound has been compromised slightly in recent years at the expense of ever thinner screens and even better quality of picture. For the absolute best results, partnering a sound bar or home cinema system with your television might be worth considering. The built-in speakers within most TVs often lack true surround-sound quality, booming bass and crystal clear treble on its own. We've already mentioned making sure you buy a second hand TV of an appropriate size for the room you intend to watch it in. You need to also bear in mind whether wall-mounting is a viable option. It will obviously depend on the layout of the room and you need to make sure that the wall you use is strong enough. Cavity walls are unlikely to be handle the weight of a large screen model. Also consider what devices you want to partner the used television with. A stand offers you a bit more flexibility and greater ease to change things around should you want to. You're likely to see more used TVs with curved screens. These are fantastic for producing a superb viewing experience - they are specifically designed to recreate the way our own peripheral vision works. They look great too and are best viewed by sitting directly in front of the screen to benefit from the best field and depth of vision. Curved screen TVs have a science behind them, not just a pretty design. Because they are modelled with peripheral vision in mind, they aim immerse and engage the viewer more than ever before. But remember, they don't actually give better image quality. A Smart TV enables you to access online content via apps that are in-built to the television. This allows you to stream your favourite programmes and films and to use catch up services, as well as accessing streaming platforms such as Amazon Prime and Netflix. The range of apps that are available vary between different makes and models, so check the listings of used televisions. So there you have it, you now have all the information you need to go ahead in the search for a second hand television. Good luck in your search! usedtvs.co.uk has been developed to bring together some of the best deals on used TVs for sale in the UK. With savings of up to 70% on 1000's of TVs we're sure you'll find the perfect one for your needs! What are TV processing rates and why do they matter? What can I watch in 4k Ultra HD?